This Is My Faster! : Just one LR to go...and WYR? So it's Monday...the start of a new week...and I realized this morning that my half marathon is in TWO WEEKS! The beginning of the race will be a bit confusing I think...I'm going to have to pay close attention to the signs along the way. 1. Get new running shoes or new running clothes? I would definitely prefer new running shoes! I wear my shoes down very quickly (a lot faster than most runners) not because of high mileage but because of a poor gait and a heavy foot fall. I can already see that I will need to replace my Brooks GTS 13s before the end of the year. They currently have 150 miles on them (give or take...I keep track of my shoe mileage because of my risk for injury). I love new running clothes, but I would absolutely prefer new shoes any day of the week! 2. Run in the early morning or run at night run? I'm an early morning runner for sure. I like the crack-of-dawn morning runs because I feel like I'm starting my day off on the right foot once I have completed my run. I rely on that endorphin rush to get me through the day, and somehow the thought of working for the whole day and then having to go and run seems stressful. I wasn't always an early morning runner though. When I started running last year I would run after work...but there are so many factors that affect evening or night runs (the Summer-time bugs being a huge one) so I switched to running in the morning. Another great thing about running in the morning is that if you miss the run (for whatever reason) you still have a chance to "make it up" in the evening/night...almost like a "safety net" for your training. 3. Run a dull "no-fun" 5K with no water or support on the course (and no finisher medal!) or a fun-filled, music pumping, full-of-support marathon with as much cold water/Gatorade/<insert your favorite energy drink name here> and the best finisher medal you've ever seen? It should be pretty obvious that I'm partial to the marathon option....after all the 5K doesn't give you a medal. But apart from that obvious reason, I would rather do a marathon because I haven't run one yet and it's my ultimate goal. I know many runners that dismiss the thought of running double digit miles...but for me I can hardly wait to run a full! 4. Use a running app or GPS running watch? I've been sending subliminal messages to my family members all year about the Garmin Forerunner 220 watch that I want (the purple one). All year. I'm eagerly anticipating my dreams coming true on Christmas morning...I'll keep you posted. In the meantime I enjoy my Runtastic app. The challenge with using my phone is worrying about battery life (and the challenge with the GPS watch is worrying about getting a signal). 5. Run a destination race or run one closer to home? I love to travel so destination races are my #1 pick! The familiarity of running in an area that you are (relatively) comfortable in is great, but destination races give you the opportunity to explore a new city, enjoy different scenery...sometimes different cultures. And, best of all, you can make your destination race trip into a "racecation"! 6. Run on the trails or run on the roads? I am not a trail runner. Do you know what lives on the trails?...lizards, and all their critter family and friends! 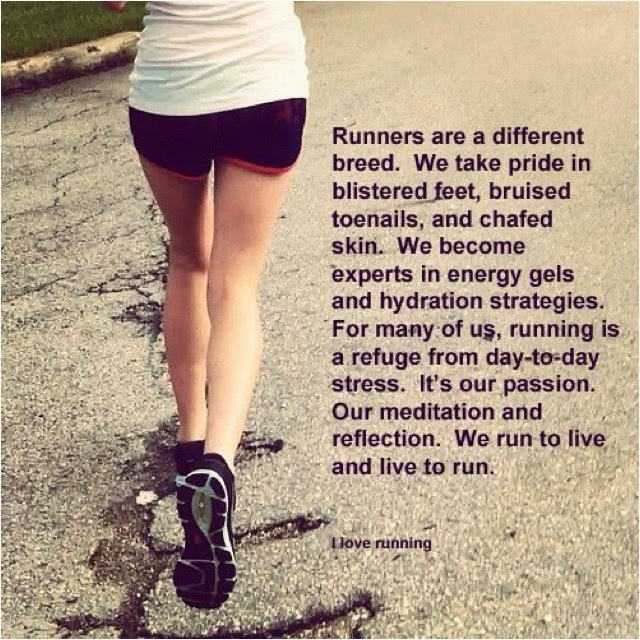 I'm definitely a "road runner" (even though the road is harder on your joints than running on the trails). I also am very wary of running on uneven terrain and trails tend to have that a lot. 7. 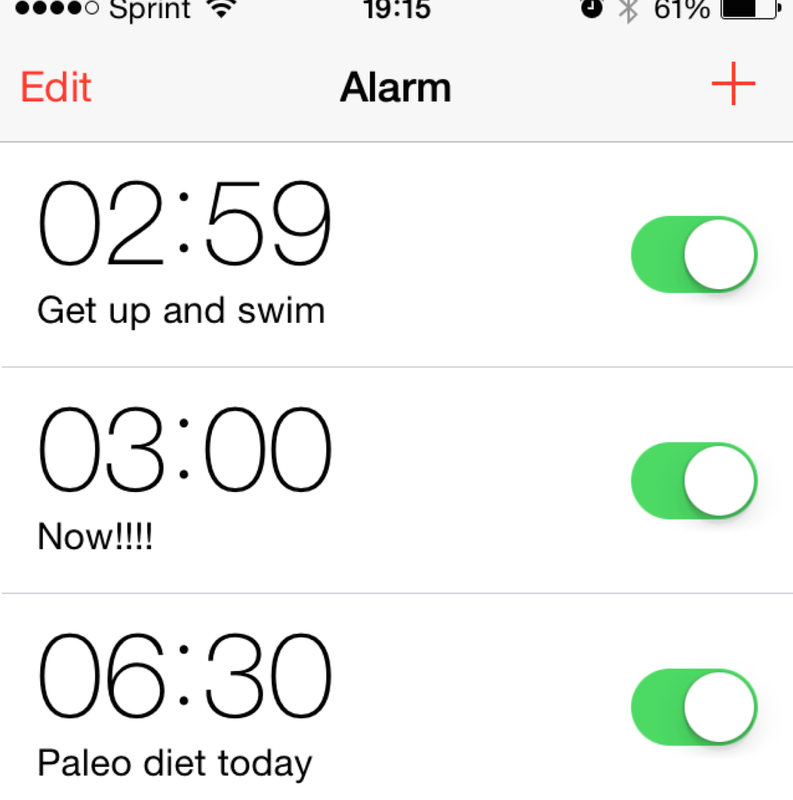 Cycle for cross training or swim for cross training? Definitely swimming!! And not just because I'm training for SwimMiami2015. As much as I have resisted swimming in the past it is a great cross training workout for me. The bike (upright, recumbent or road) is great, but if I had to choose I would rather be in a nicely heated indoor pool (or in an outdoor pool in the summer sun) than on a bike pedaling away. 8. Run in the rain or run in the snow? Wow...this is a hard one. I have never run in the snow and I'm not a huge fan of being cold. But I'm not a fan of getting soaking wet either. I guess if it starts to rain or starts to snow while I'm running that would be better than having to start out in the weather elements. And if I absolutely had to pick then I would take snow over rain....I think. 9. Run solo or run with a group? Also a hard one. I have had some amazing solo runs...just me and the road...but recently I joined a running group and I love running with others. When you have great company the miles just slip away. So while I can do my runs solo if I have to or when I choose to, my new favorite is running with others. 10. Run a flat race in the heat or a hilly race in cool weather? I. Hate. Hills. I know I have to do them but I don't like them. I live in Florida so I'm accustomed to the heat and accustomed to running on flat courses. Maybe one day I will fall in love with hills (doubtful but anything is possible) but until then I would rather run a flat course in the heat over hills (no matter what type of weather). 11. Have chocolate as a post run treat or ice-cream? Back in the day, when I used to be able to eat Coldstone Ice Cream this would have been a "no-brainer" for me. But now I have to stay away from dairy (migraines etc). I have tested and tried a wide variety of flavors and brands and for me Soy Chocolate is better than Soy Ice-cream, so a post-run chocolate bar would be my pick. Do any of these resonate with you? Tell me which ones you would rather do/have!!! Oh!!! 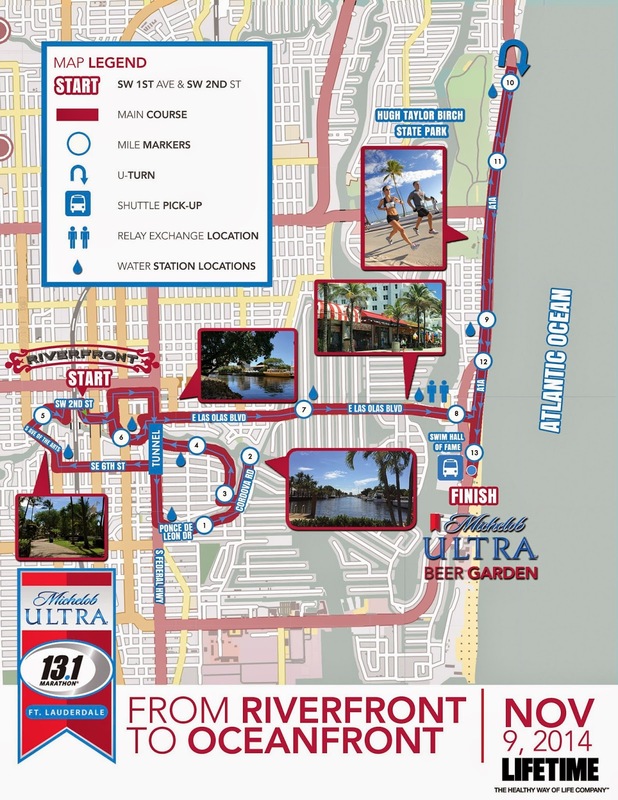 Apparently I have not looked at the course map for Fort Lauderdale at all because I am surprised it is different than last year! Last year we ran less downtown and further down A1A. I think I will like this course a lot more! Running through the tunnel is always fun because everyone yells and cheers! I love your questions and answers!